What a story! This one will run and run. [Link to Part I of the gold train story here.] [Link to Part III of the gold train story here.] An antidote to all the bad news that assails us from east and west. Where's the gold train? Don't believe those who say the area is so wide it could be anywhere. It couldn't be just anywhere. It has to be somewhere close to the railway network as it was in the wartime German region of Niederschlesien - today's Dolny Śląsk (Lower Silesia). 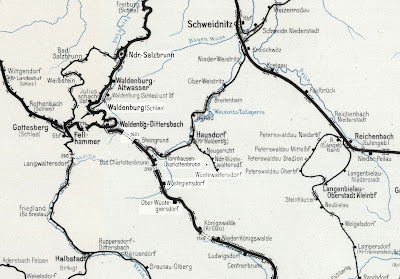 Using Google I found some WW2-vintage German railway maps of the region from 1944 (below, click to enlarge). There are two possible locations - one is currently under intense media scrutiny, and crawling with treasure hunters and police (500zł fines being handed out for trespassing on railway land). This is the one I alluded to yesterday. The other... Bear with me. Now let's look at the same area on a modern real-time map of the Polish state railway network. (That green icon is a Koleje Dolnośłąskie train heading towards Wrocław). Bear in mind that Waldenburg is now Wałbrzych, Schweidnitz now Świdnica, Reichenbach now Dzierzoniów, etc. OK. So back to the mainstream theory... the gold train is in a tunnel that was dug under Książ castle, north of Wałbrzych. The spur comes off the main Wrocław-Wałbrzych line at around Kilometre 65, the line heading to the tunnel branching off the main line some 1.2km north of Wałbrzych Szczawienko station. So - photoshopping the Google Earth map of the area, we have this. Far more likely than this, which has appeared on the internet as a contender... Bahnhof Nieder Salzbrunn (bottom of 1938 German map) is today's Wałbrzych Szczawienko station. Wrong side of the line - this location lies lower than the tracks, and any slope leading down to a tunnel in this place would be too steep. Besides, the 1938 map doesn't refer to a spur swinging off to the north - which would have been built between 1938 and 1945. But here's my theory. Based on the secret of Box Tunnel in Wiltshire, my hunch is that the Nazis built a spur off the 1.6km tunnel (the longest railway tunnel in Poland) along the line linking Wałbrzych with Kłodzko, to the south-east. This is nearer the location of the Projekt Riese complexes. Possible location no. 2. And here's a bit of back-up evidence. Service on the single-track Wałbrzych to Kłodzko line is being suspended from 1 to 30 September - between Wałbrzych and Jedlina-Zdrój. A replacement bus service will be in operation. Making any connections? Let's hope we'll soon find out where the legendary treasure train is - to date, all that turns up in secret tunnels under Polish railway stations is illegal meat-processing factories! In the meantime, Wałbrzych will be experiencing an influx of the curious like never before. "What do we want?" "Early retirement!" "Besides, the 1938 map doesn't refer to a spur swinging off to the north - which would have been built between 1938 and 1945." The spur is from 1970s. 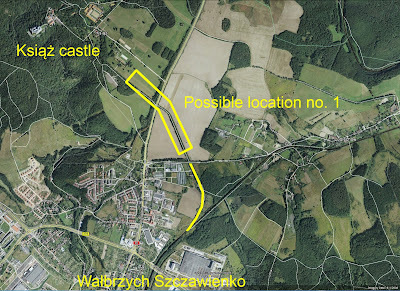 And the location that you propose is impossible, because it is outside of Wałbrzych borders, while the only thing that authorities confirm is that it is located inside the city borders. Have a good look at Wałbrzych's borders (city not poviat). Google Maps clearly show them. The tunnel that's my second proposed location falls partially within the remit of the city authorities. Check 'Góra Mały Wołowiec'. As to the spur from the '70s - that's to the old porcelain factory, is it not? 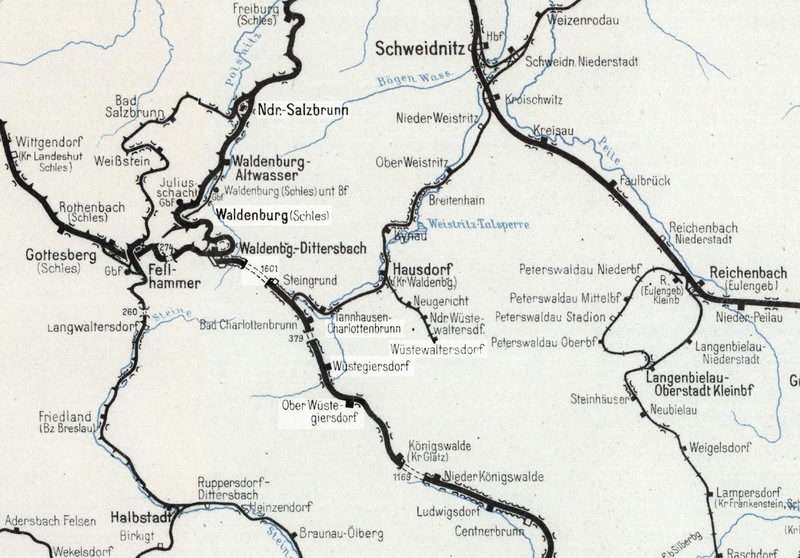 Your theory for the second location is certainly supported by evidence for a complete long-distance telephone communication connection planned for within the Ochsenkopftunnel and at the railway station Bad Charlottenbrunn for the Führersonderzug according to this source: http://forum.hidden-places.de/showthread.php/1935-Objekt-Riese-Objekte-in-der-Umgebung/page2?p=23840&viewfull=1#post23840. Train was supposed to stand on railway track typically under full steam and moved inside the tunnel if danger approached. 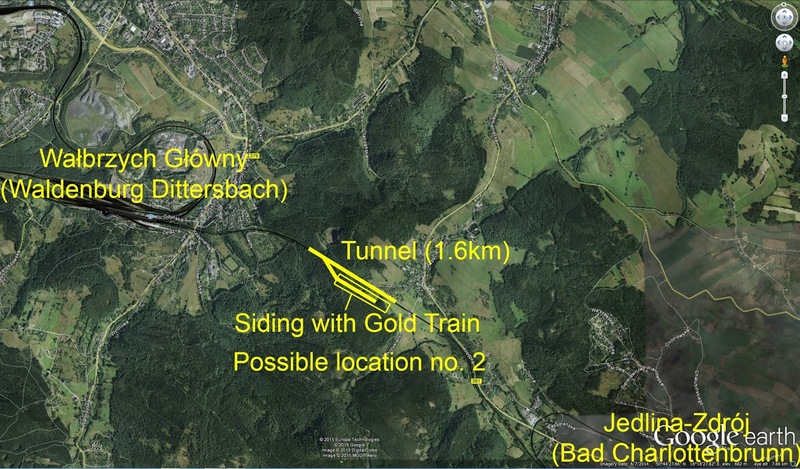 Some sources also claim to have found a chimney inside the Ochsenkopftunnel allowing the Führersonderzug to remain under full steam even inside of the tunnel. Indeed - if you check Panoramio images for the area, you'll come across one labelled: "FHQ-Riese Schutztunnel für Führersonderzug, Rauchabzug", taken by Ralf Loehder. The tunnel was originally twin-bore, but one of the two lines was closed in the 1990s due to lack of traffic. Interesting to note whether this chimney is aligned with one - or the other bore. Or indeed whether it leads to a third tunnel! Hey, wait! I was there four weeks ago and drove back and forth the National Road no. 35 over the possible location no. 1 and I was completely unaware I could have been driving over the gold train! Why has nobody tipped me off? This photo of the entrance to the tunnels (between Dittersbach and Steingrund) reveals more than can be seen today - no trees. And the tunnel entrance is - apparently, according to the Silesian Research Society (?) just beyond a bridge. This bridge in the photo? It's so tempting to think it so. There were two tunnels, each single bore, and apparently during the war one of the tunnel was regularly used for 'special trains'. Does this signify something? Does this mean that only one tunnel was used for through traffic, with the second being used for some secret underground construction. Maybe, maybe! The story has certainly sparked a lot of interest, with several locations being touted as the location of the train. The "Atlas Linii Kolejowych Polski 2011" (written and Stankiewicz and Stiasny), a worthwhile reference document in it's own rite, shows the detail and history of the lines and former lines in the area. No line (or former lines) are shown heading as a spur to Ksiaz Castle. The line to the other side spurring off is shown going to the former porcelain factory. Rumours circulating are that the heavily wooded area around the 61km mark are also in contention. Both tunnels on the Wałbrzych-Kłodzko line were still open and used even after the World War II. I agree, but I believe there was a circa 10 year period from 1945 to approximately 1955 when only one line was in use, before the second line was re-instated. Kauft euch alle mal eine neue Brille (!) und schaut euch mal die Tunnelportale mit eingeschalktetem Verstand an !!! Anonym - Weil ich dazu schon bedroht wurde! Whatever happened to Poland's Amish?